Do you know someone who is #MadeOfGreat? I do, and his name is Atal Bihari Vajpayee. Who doesn’t know Atal Bihari Vajpayee? Arguably India’s most famous Prime Minister, the man is a legend. Let me start with these, and explain exactly what they mean to us as Indians. The Dehu Road – Katraj Bypass at Pashan in Pune along the Mumbai-Pune-Bangalore National Highway. Image copyright Amit20081980, CC-BY-SA 3.0 Unported, available on the Wikimedia Commons. The GQ was envisioned as a set of four lane highways connecting the four metropolitan cities of Mumbai, Chennai, Kolkata and Delhi. It also included India’s first major Expressways; Mumbai-Pune, Delhi-Gurgaon, and Ahmedabad-Vadodara. Barring a few stretches such as the Udaipur Bypass and the Hubli-Dharwad bypass, it was mostly four-laned, with a few sections being six laned. The net result? Travel time to between various cities shot down by 50%. Subsequently, the UPA government decided to six lane the GQ, while several state governments initiated similar programs for four laning their State Highways. The impact of the Golden Quadrilateral was felt immediately as sections were completed. Nearly 95% of the project was completed before the NDA government left office, and one must congratulate Major General BC Khanduri, then Minister of Surface Transport with the Government of India and Nitin Gadkari, Minister for Public Works in Maharashtra till 1999 for laying the groundwork for future projects. The bulk of the project was funded through a 1% cess levied on fuel and recovered by collecting Toll. The GQ also saw the construction of India’s first and so far, only National Expressway, the Mahatma Gandhi Expressway, connecting Ahmedabad and Vadodara in Gujarat. The only major non-National Highway section on the GQ is the Yeshwantrao Chavan Expressway, built by the MSRDC, connecting Mumbai and Pune in Maharashtra. Another major project initiated under the NHDP by the NDA government, this project aimed to connect Srinagar in the North to Kanyakumari in the South and Silchar in the East with Porbandar in the West. The connected major Indian cities that were not covered by the GQ, such as Hyderabad, Nagpur, Jabalpur, Coimbatore, Cochin, etc. It also laid the basis for the Port Connectivity Projects, Sagar Mala, Bharat Mala, etc by subsequent governments in the centre. Again, it also spurred several state and city funded projects to provide connectivity between National Highways and others towns as well. Two notable projects include the four laning of the Bangalore-Mysore State Highway connecting Mysore to both the GQ and North South corridor at Bangalore and the six-eight lane Hyderabad Outer Ring Road that connects the two arms of the Sringar-Kanyakumari, Pune-Vijaywada National Highways apart from numerous state highways passing thru Hyderabad. A PMGSY Road marker in Jalandhar. Image Copyright Gopal Aggarwal of http://gopal1035.blogspot.com. Image available on the Wikimedia Commons under a CC 2.0 Attribution Generic licence. The Pradhan Mantri Gram Sadak Yojana [PMGSY], literally translating to Prime Minister’s Village Roads Project, was initiated by the NDA government in order to provide all weather roads to villages that were hitherto unconnected. In 2010, it was reported that the PMGSY started changing the lifestyles of villagers in the North Eastern Parts of the country. A very noble plan, it has impacted villagers massively, offering them connectivity which has in turn boosted trade and helped villagers deal with others without middlemen as well. Of course, the subsequent UPA government tried to hijack the project with Jairam Ramesh infamously stating that the Project was Atalji’s “Poem” but it was the subsequent government that gave it the wings. A fine way to steal credit, might I add. 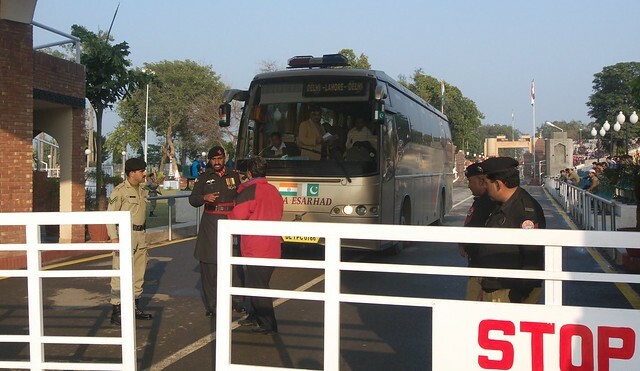 The Friendship Bus Delhi-Lahore at the Pakistan-India border. Image Copyright Lorenz Khazaleh, CC-BY-NC-SA 2.0, available on Flickr. This was the most amazing thing that Atalji’s government did. A bus connecting two neighbouring countries that have been at war for most of their history. Officially known as the Sada-e-Sarhad, it was launched on 19 February 1999 connecting Delhi and Lahore via the Attari-Wagah border. A gesture of friendship between India and Pakistan, it continues on today, 16 years later. It is jointly operated by the Delhi Transport Corporation [DTC] and the Pakistan Tourism Development Corporation [PTDC], who run buses on alternate days. It laid the basic framework for the introduction of the Delhi-Kathmandu Bus by the DTC and the Kolkata-Dhaka-Agartala buses by the Tripura Road Transport Corporation [TRTC], West Bengal Surface Transport Corporation [WBSTC] and Shyamoli Paribahan [SB] a decade later. In 2015, India was a signatory of the Bangladesh, Bhutan, India and Nepal Motor Vehicles Agreement [BBIN MVA], for seamless movement of road traffic among the four nations. This achievement, combined with the launch of international bus services makes international road travel something every Indian can look forward to. At the end of the day, one can say that Atal Bihari Vajpayee was certainly one of the best Prime Ministers we had. By laying a solid foundation in the transport sector, he effectively ensured that all other sectors benefited and the economy grew and that millions reaped rewards. So next time you take your brand new Tata car out for a drive and cross 100km/hr, remember that it was Vajpayee who made it possible. This post has been written for a competition organised by Tata Motors because Football legend Lionel Messi has been roped in as their Brand Ambassador. For more details, head to http://madeofgreat.tatamotors.com/. You stand a chance to win a voucher worth ₹750 from Amazon if you are able to answer the following question: “What do you think of Tata Motors’ association with Lionel Messi?” in the comments below. Make sure you aren’t left out! Please post your comments by 25th November 2015.